Here's a de-lovely little number for those weeknights when you're a bit pressed for time but want to bring something hearty to the table. 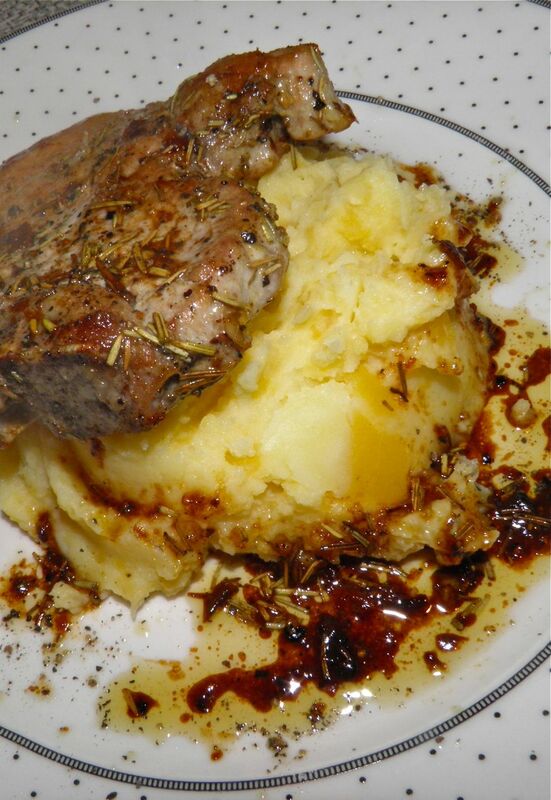 One of my favourite foods is lamb chops broiled with lots of garlic and rosemary. Sadly, lamb is priced beyond affordability for many people – me included (except for a special occasion). Thank goodness it's just as easy to replicate those flavours with pork chops and a frying pan. Since we moved I've found one of my best friends has become my 12" KitchenAid cast iron skillet. It may be because I have found out how useful it is, or maybe it's just one of the first things we unpacked. Either way it doesn't matter. We all should have a cast iron skillet. It makes cooking meat so much easier. It's a snap to sear something on the stove top and then throw pan and all in the oven for a slower roasting to finish. That simple technique works well for thick steaks, roasts and even half chickens. Remarkably well. This night I didn't finish the chops in the oven. I opted instead to steam them with wine. I always happen to have a bottle of white hanging around for just that purpose. Do you? You should. A tip for purchasing "cooking" wine is never buy anything you wouldn't drink. Some alcohol may burn off, but the taste remains. You can also then have a glass on the counter to help you cook! If you're looking for something inexpensive, homey and delicious – without a lot of work – you should try this recipe. 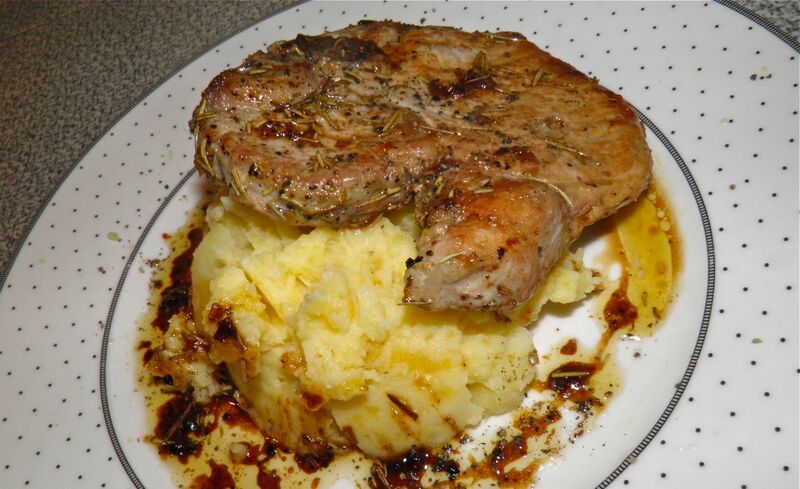 If the pork chops are on sale (mine were 30% off) it's even better! Peel and chop the potatoes and turnip. Place in a pan with water to cover. Add 1/2 tsp of salt, cover and bring to a boil. Reduce heat to simmer and cook for 20 minutes. Meanwhile, heat the olive oil gently in a frying pan. Add the garlic, rosemary and pepper. Once the garlic becomes fragrant add the chops. Sear on both sides until browned. Salt the sides as they sear. Add the wine and tightly cover the top of the pan with foil. Let the chops steam in the wine for 4 minutes. After that time they should read 170°F internally. To serve, mash the vegetables with lots of butter. Place a mound of vegetables on the plate. Top with a chop and drizzle any pan juices on top.